San José, Ibiza. Espai Kru, one of Spain’s most prestigious restaurant groups has arrived at Cova Santa bringing with it a brand new menu that offers the finest, freshest ingredients from all over the world. Espai Kru, one of Spain's most prestigious restaurant groups has arrived at Cova Santa bringing with it a brand new menu that offers the finest, freshest ingredients from all over the world. A variety of cooking techniques are employed, taking from many world-cuisine grandmasters such as those of Peru, China, Japan, Korea and Mexico as well as those of the Mediterranean. Tables are set out on two levels with an amazing panorama of green all around - a very privileged elevation and one in which to feel at one with nature. VIP tables, including a lovely pagoda give options for a stylish and luxurious dining experience. The new menu is the perfect partner for the philosophy of Cova Santa: to provide the finest gastronomic experience in one of the most magical venues on Ibiza. A natural cave of over 25 metres deep is right next to the restaurant and can be visited; it has been formed by the waters falling down the San José mountains over a thousand years. Expect the perfect execution of raw food with varieties of carpaccios, succulent sashimis and tasty tartares. Here, you will find some of the best seafood preparation on the island, including wonderful turbot, lobster, spider crab, oysters and clams. Meat lovers will adore the grilled Wagyu beef and slow-cooked Angus prime ribs. 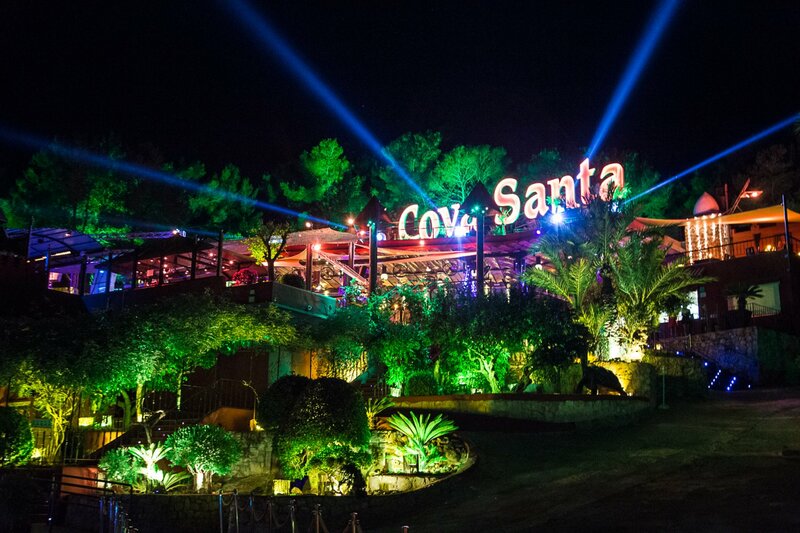 As well as the restaurant, on Sundays Cova Santa is the venue for the spectacular WooMoon with a heady and eclectic mix of artists from around the world and stunning live dance and performance shows. The restaurant makes the perfect vantage point to watch the night unfold plus after the meal is finished you can dance the night away. Cova Santa brings with it a brand new food experience that is one you will surely want to try for yourself. Call us on +34 971 39 57 14 or send a booking request below.